This is my family.I have 5 sisters plus me is 6 one brother and a beautiful mother name Melissa vili. All My sisters names are Nu'u,Chantelle,Kathleen,Ane and Yvonne My brothers name is Ray.We live in Auckland New Zealand. I really did enjoy seeing this Sarona. What a beautiful photo of you with your Whanau. Kathleen looks so grown up I nearly didn't recognise here. So do you have a favourite sister? 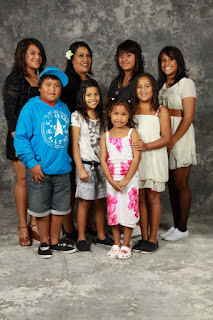 Hi Sarona cool picture of your whanau keep up the good work.